1989 what a summer! I've been a fan for 28 years since I heard them on the radio way back when. I got to attend the Magic Summer Tour at Lake Compounce and held my I love Donnie sign proud. Then they made their comeback announcement on my birthday April 4th in 2008. I was then pregnant with my 2nd child and straight up screaming with joy at the tv in my living room. Donnie. He is an inspiration, he gives me life. I have a hard time explaining it, only BHs understand. He was such a bad boy and so cute and didn't give a f of what people thought - I loved that. And the more mature Donnie stole my heart too. He is just so handsome, suave, and HOT. What else can I say. He is really the longest relationship (lol) with a man I've ever had! I know how crazy fan-girl this sounds. 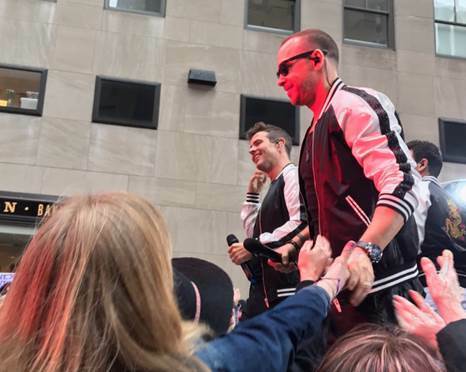 Do you have a NKOTB non-cruise related story to share? I have many... I'll tell the I heart radio story. It was a very intimate venue in NYC during the media blitz for the album 10 release. I was lucky to get tickets from a radio contact of mine in Hartford. Again, it was my birthday (swear,) this time in 2013. The girls around me were screaming to Donnie that I was my bday and he pulled me onstage to dance during Remix. It was a dream. It was the first time I was so close to all of the band. OMG it was just amazing. Also the show was live strewing and my brand new friend at the time. Maria, who I hadn't yet met but I'll get to that story - she was watching the live stream and saw her cruise roommate get onstage!! Lmao. Here is that concert if you’re interested. It was Maria who talked me into it I think! I said why not?! 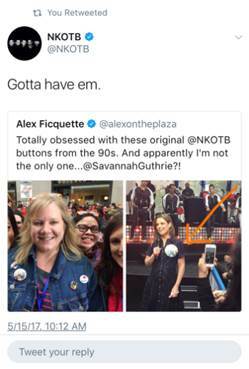 If it is anything NKOTB related, I'm down for the adventure. There was an interview process and one was a Skype interview and I remember throwing a pink hair extension in my hair and locking myself in my bedroom closet to escape my kids in order to concentrate on the interview! When the interviewer asked if we could sing one of their songs I bust into The Right Stuff, Maria & Pallavi joined in, and I think they liked us for the show from that point. Even after the first filming at Pallavi's home though, we weren't guaranteed to be on the show. Some still got cut after that point. Did you receive compensation for being on the show? Did you get a discount on the cruise? Yes we received compensation, no we did not receive a cruise discount. You had to be booked on the 2014 cruise already to be eligible to be on the show. Yes, once in 2013. I was going through a divorce at the time and booking that cruise was one of the best decisions I ever made. 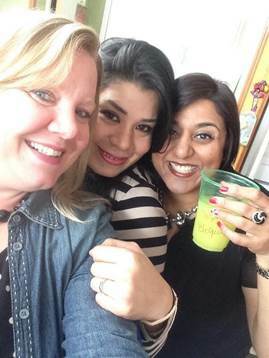 I went by myself, met Maria for the first time and we just had a blast and became really good friends! We laughed til we cried at points and danced til dawn every night. Even though the cruise is a once-in-a-lifetime experience, I decided on the last day that I HAD to return. Oh yeah, people really hated on the show. I don’t think I was ever personally attacked but I just felt horrible about all the negative feedback on the show as a whole. I think I only got positive feedback from friends and family who probably thought they had to, lol. Never. I have been recognized at New Kids events though. NOTHING was arranged for us for the show. The last night was the closest I got to Donnie (besides the photo-op) because of Maria’s brain child – the NY City skyline skyscraper hats. He saw them, liked them, and called us up on one of the B stages. A typical cruiser is guaranteed the group picture which is very up close and personal & any other encounter is pretty much luck and being in the right place at the right time – which is probable! The really do put themselves out there for us. 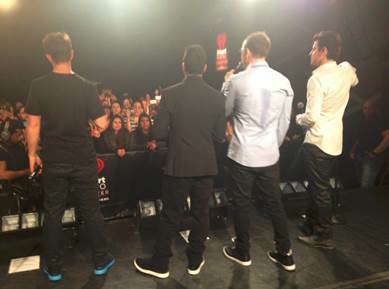 What was your relationship to NKOTB prior to the cruise? How about now? 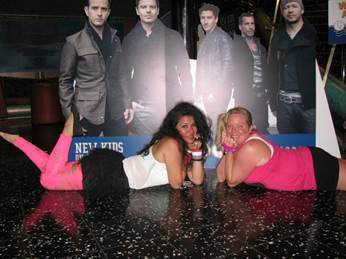 The only relationship I had with NKOTB prior to the cruise was in my imagination! After the cruise and other events, yes, Donnie knows who I am. When we went back to nyc for the final green screen shoot, Maria & I visited Donnie on the Blue Bloods set and he said something to the effect, “Of course I know who you guys are, you did the flyboarding, I’ve seen ALL the footage.” Supposedly he was very involved with production of the final product. Are you friends with any of the other cast members? Yes! I’m friends with many of them personally & we (almost) all connect & keep in touch on social media. If you could do it all again (being a cast member) would you do it? Yes, like I said before, if it’s New Kids related, I’m down for the adventure. Not really, it is what it is & I have no regrets. Many cast members were really bullied on social media though and it was undeserved and straight up mean. Don’t be rude to other BHs. 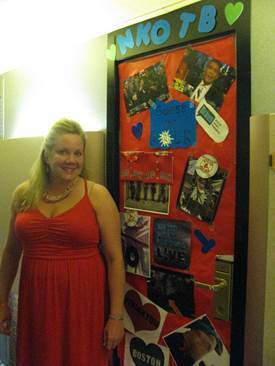 There is no need to sit and wait in the hallways near their rooms, go enjoy the cruise experience! The concert. Their music and performing is what I fell in love with back in the day and seeing them perform live in such a casual intimate setting is amaze balls. 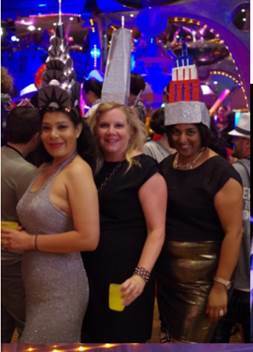 But the lido deck parties are just so fun too! If you are a New Kids fan and like to have a good time, this is your jam! It is really that much fun!! You see them multiple times daily with all the events!! Just imagine seeing all 5 New Kids every day for 5 days! !